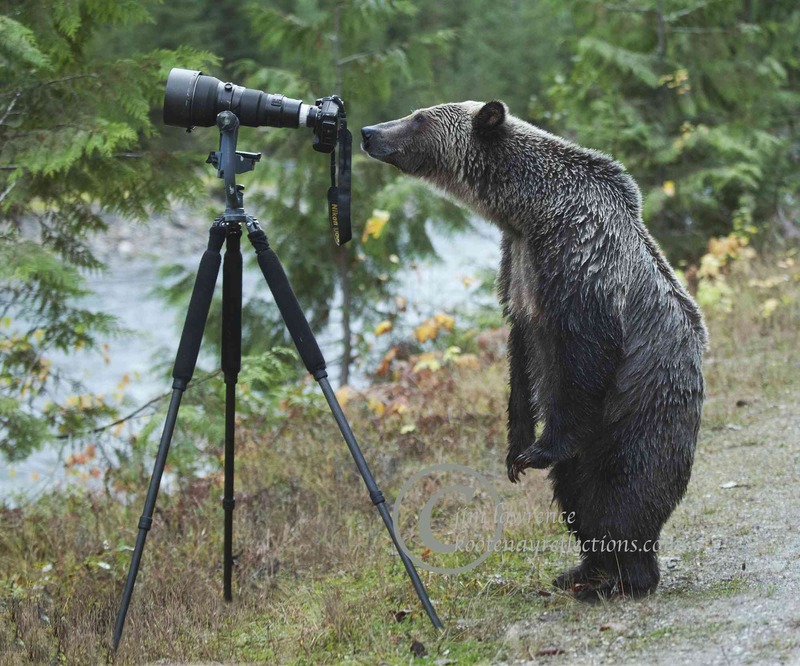 The image has inspired Lawrence and Needoba to get political, and so they have launched a petition to stop the trophy hunt of grizzly bears in British Columbia, in response to an offer by MLA Michelle Mungall to introduce one in the Legislature. “Online petitions are inadmissible in the Legislature, so hard copies of names and signatures are required, making collecting hundreds of thousands of them a formidable task!” says Needoba. So the artists are calling on BC residents, businesses and organizations alike to also get involved, and download and print out copies of the petition and collect signatures and send them in. The petition can be downloaded at www.smalltownfilms.com [Click here for pdf: Grizzly Bear petition_HARD_COPY copy ] Or call 250 352 5905 to arrange to have some sent to you. Lawrence and Needoba while on a regional tour have been engaging audiences in a conversation about wildlife and their habitat. Lawrence often cites a London Zoological Society report (ZSL) that suggests species populations have halved in the last 40 years! Here in the Kootenays an audience member recalls how fifty years ago he remembers seeing porcupines everywhere, but he has not even seen one in recent years. Large carnivores such as grizzly bears are particularly susceptible to the impacts of human activity, especially through loss of habitat and the obvious difficulties co-existing with humans, and that is not even including the impacts of climate change. “With so much to contend with already, banning trophy hunting of grizzly bears just seems like one small step in the right direction,” says Needoba. “According to polls, around 90% of British Columbians oppose the trophy hunt. So it shouldn’t be that hard to get enough signatures on this petition to make change. If you oppose the trophy hunt please sign this petition! Are you a resident of British Columbia? Do you oppose the trophy hunting of grizzly bears in British Columbia? Then please add your name and signature to this hard copy petition and send it in! Currently, only paper-based petitions with original signatures can be brought forward in the B.C. Legislature so please follow instructions below and help spread the word and lobby for ending this practice! - Trophy hunting of grizzly bears has no place in modern wildlife management practices and policies. - Eco-tourism and bear viewing is a growth industry that encourages sustainable practices and benefits local economies, and can provide more revenues than trophy hunting. These animals should be protected not hunted and their habitat conserved, so that future generations will be able to experience these magnificent creatures. Print out petition document and fill in your name and community and sign the document. If possible find 14 or more other people who are opposed to the trophy hunting of grizzly bears to sign the petition to complete the form(s). NOT A RESIDENT OF BC? WANT TO DO MORE? Air Canada and WestJet have banned the transport of big game out of Africa, but continue to allow the transport of Canadian animal ‘trophies’, such as black bears, grizzly bears, polar bears and wolves. Sign and share this petition to tell Air Canada and WestJet they should be taking a stand against trophy hunting in their own backyard.